A good cup of coffee isn’t easy to come by and if you are big on caffeine, you’re probably picky about your grinds. Manual coffee grinders are a great asset for someone who is always on the go and hopefully, you can find one that suits your needs. 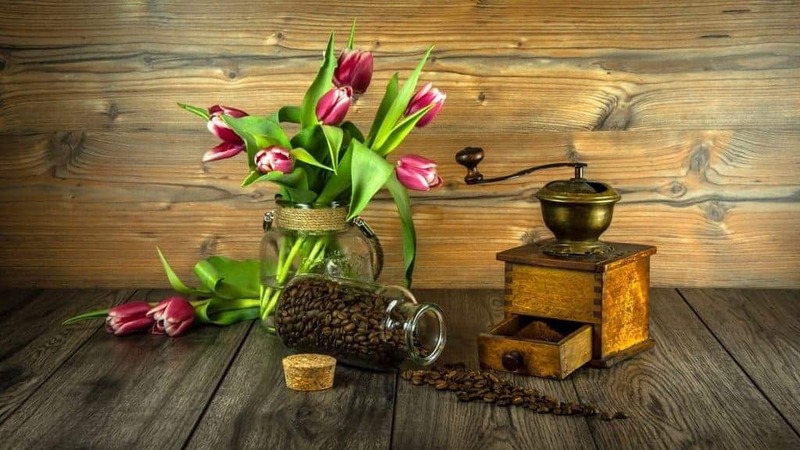 This post focuses on reviewing the best products on the market and what you should consider when buying a coffee grinder. Particle size relates to how fine or coarse you like your coffee. You may choose to go with a small particle size or large particle size grinder, depending on your brewing method. An important element of particle size is consistency. The important thing is to ensure that all the particles are of the same size because an inconsistent particle size only leads to an inconsistent cup of coffee. They use a sharp blade to hack up the coffee into small pieces. And while you have little control over particle size and consistency, the good news is that you can improve the grind quality. The best thing about blade grinders is that they are affordable and readily available. Despite their flaws, their small size makes them a great option for those who are starting to learn how to grind at home. Hand grinders make a great investment for someone who is interested in manual brewing on a small scale. They are an economical and practical option for brewing a cup or two at a time. Hand grinders are similar to burr grinders, with the only difference being that a small nut is used to adjust the grind size. Compared to blade grinders, burr grinders produce more consistent coffee. They use a set of ceramic burr or metal to crush coffee beans. Depending on the preferred consistency, you can use flat or conical burrs and once the right particle size is achieved; the ground coffee falls into the hopper. The main downside of burr grinders is that they are expensive, but the extra cost is worth it. This is our personal favorite and one of the sold grinders among travelers. It is reliable, more so when purchased with an upgrade kit. It produces consistent coffee and is incredibly versatile. In addition to travelling, the Hario Skerton Coffee Mill is great for home use. If you want an expertly crafted manual grinder for espresso, the Zassenhaus Santiago will prove a worthy investment. Its 25 year no break warranty is a clear testimony to the high quality grind capabilities. Since it is smaller than standard burr grinders, this is a great option for those who love to travel. Its size allows for added style, which includes the beautiful mahogany veneer exterior. The grind size dial is another major highlight that allows for a variety of grind settings. What makes the HandGround Coffee Grinder exceptional is that it delivers consistency on par with a good electric burr grinder. You simply throw the beans into the hopper, set the grind setting and turn the handle. It doesn’t feel like an arm workout as someone would expect. You will love that it offers fifteen grind settings, allowing for almost any brewing method. 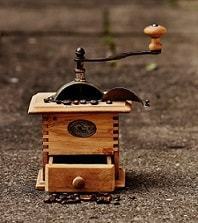 However, you won’t be able to brew super-fine or Turkish coffee but that is common among hand coffee grinders. With the Handground, you get to choose a grind setting and use it again and again. You don’t get this with many hand grinders. The ROK coffee grinder comes with a polished aluminum exterior that gives it a modern look. It is probably the best when it comes to performance and this is attributed to two things. It is easy to use and produces quality grinds. The quality of the coffee produced is just as good as what you’d get with an electric burr grinder. You can grind the beans with just one hand and at half the time compared to traditional models. Travelling coffee fanatics will love what the Porlex Mini Grinder. It features a cylindrical shape, making it an ideal option for backpacking and other outdoor adventures. The grinder fits nicely into the Aerospace thus making packing convenient. The stainless steel makes it nearly indestructible and easy to clean. This grinder is also adjustable and produces accurate grinds for different brewing methods. As much as we love all of the above coffee grinders, the Hario ﻿﻿﻿﻿Skerton﻿﻿ certainly takes the crown. The hand grinder allows for various brewing methods and is easy to use. More importantly, it delivers exceptional performance and consistency. What is Happiness and How to Cultivate It? How Fear Works and How to Deal with It? What is Motivation and How Does It Work?